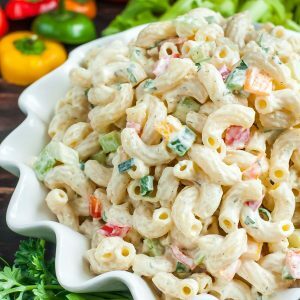 This quick and easy homestyle macaroni salad is the perfect side dish for your Spring picnics and Summer barbecues! Is it time to start doing our long weekend happy dance yet? I hope so because I’m doing it right meow! For Paul and I, it means four glorious days free of work, appointments, email and errands. Instead we’re finally picking out paint for the upstairs rooms, painting our faces off, and sneaking in a little Raleigh road trip to get our Whole Foods and Trader Joes fix while we still can. While we’re on the topic of Whole Foods (whole foods… whole paycheck… whole lotta delicious trouble!) let me take a moment to propose the most brilliant idea ever: Whole Foods should have a food blogger discount. Actually, while we’re at it, they should have a frequent shopper discount too! The sheer volume of stuff we buy there is a tad obscene. Sure we may frequent the farmers markets, discount grocery stores, and health-centric co-ops, but we still drag our butts into WF like a moth to a flame. Or really, like cookie monster to a double chunk chocolate chip cookie with sprinkles. Mabye they put something in the air there, or possibly lace the hot bar with opiates? I couldn’t quit that store if I tried, not even when my nearest one is over two hours away! Before this post turns into a love letter to Whole Foods (or a plea for them to give me my life’s savings back) let’s talk weekend barbecues! Bring on the macaroni salad! 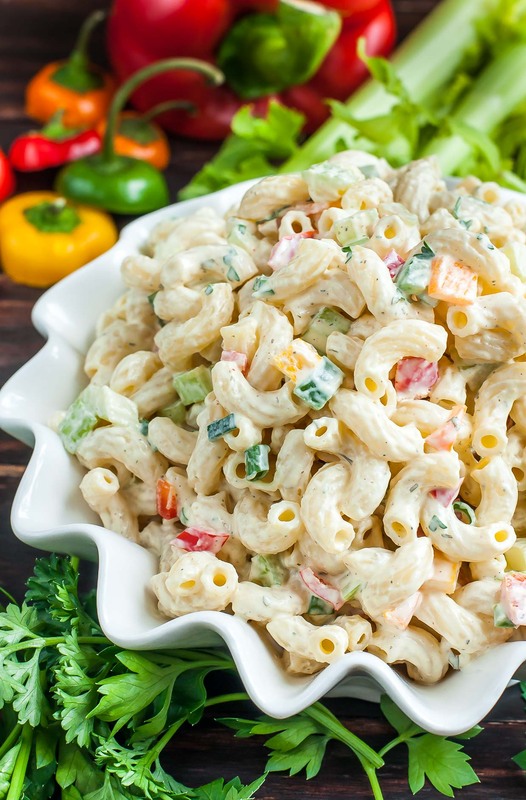 Whether you’re hosting or attending one, I’ve got the macaroni salad covered! I’ve tested this particular one several times now and can happily squeal that I found the perfect creamy dressing to smother over pasta and veggies. The greek yogurt adds protein and lightens up the dish’s nutrition stats a bit, while the eggy mayonnaise still delivers that good old-fashioned macaroni salad flavor that we all expect from the dish. Factor in the tangy mustard and vinegar and mix of herbs and spices and you have a super flavorful side dish to wow your friends with! It’s also ridiculously quick and easy to make, so put down that preservative-packed container of store bought macaroni salad and make this instead! This sassy salad features a dressing with equal parts mayo and greek yogurt, for a tangy sauce that’s lightened up and wildly addictive! Cook the noodles per package directions and drain in a colander. To make the dressing, whisk together above ingredients. Pour half the dressing over the salad and chill to allow flavors to meld. When you're ready to serve, pour the remainder of the dressing over the salad and dig in! Stir in your chopped veggies and pour over approx half the dressing, mixing well. Steal a taste and feel free to adjust seasoning as needed. Extra garlic is common in this house as is lots of extra bell pepper and green onion - add whatever extra veggies/spices you'd like! Pop the entire bowl in the fridge, covered (along with a separate container of the remaining dressing) and allow to cool. Dig in that very same day or up to four days later. This is a great potluck/party side dish that can be made in advance or whipped up and served fresh as a last minute addition! With pasta salads, anything goes! macaroni measurements: a typical 16oz box of dry elbow macaroni will deliver around eight 1/2 cup servings once cooked. If you use half the box (8oz =1 + 3/4 cups of macaroni]) you'll wind up with 4 servings. This will help if you're trying to calculate how much you need for an intimate group. If you're feeding a crowd, by all means make the whole box and skip measuring entirely. 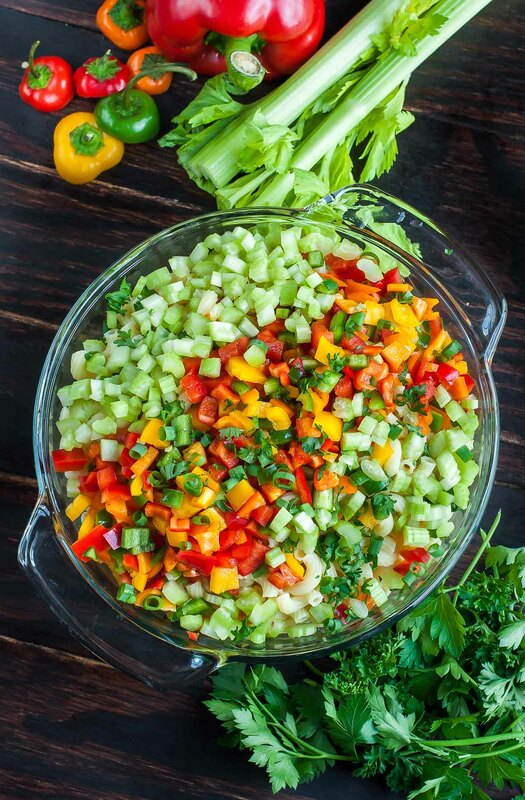 Just make sure you whisk together some extra dressing and add extra veggies. For the peppers, you can use all one color or grab bag of multi-colored sweet mini peppers and get your rainbow on! I did this for the batch pictured in the photos. Nearly all the delis here in the South add a teaspoon or so of sugar to their dressing to add a bit of sweetness to compliment the tanginess of the mustard and vinegar, feel free to follow suit and add this as well! I’ve tried it both ways and can’t decide which I prefer most! I kept tweaking the ingredients with each batch until I wanted to lick the bowl. Also, we need to talk ratios here, people. I’m willing to bet if you’re a regular around here you know what’s coming. ALL. THE. VEGGIES. vegansaurus chefs you could try using vegan mayonnaise for the sauce or a combination of veganaise and vegan sour cream as well! t-rex chefs hard boiled eggs, cubed ham, and/or bacon are common macaroni salad mix-ins if your guests insist on it. I added a teeny bit of smoked paprika to one batch of this sassy macaroni salad and the first thing P said upon tasting it was “is there BACON!?! ?” Silly rabbit. gluten-free chefs You can 100% make this with your favorite pasta! Chickpea or quinoa pastas are excellent GF swaps for traditional pasta. Stellar! 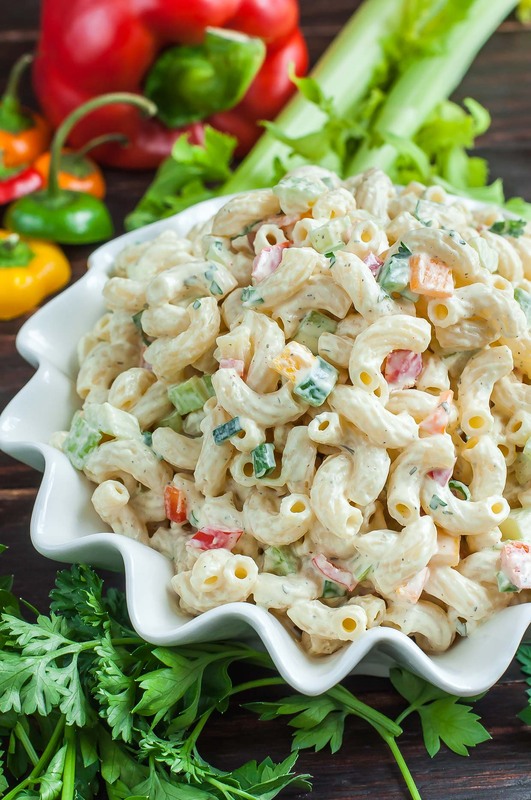 Sometimes you just need a good old-fashioned southern macaroni salad in your arsenal and this one’s an absolute crowd-pleaser! I love the mix of crisp, refreshing veggies, tender noodles, and creamy, tangy sauce. I could yammer on about it, but I should probably just let you go so you can run to the store and pick up any of the remaining ingredients you need to make this. I am thoroughly in love with your blog. My husband and I transitioned to a vegetarian diet last March, and have grown into a little bit of a slump when it comes to variety. I am so excited to try all of these recipes, seriously! I used the dressing with a mac salad of my own, with garden tomatoes, red onion, celery, peas, eggs and chopped dill pickle. The dressing is a great tangy compliment. Thanks! We don’t do yogurt of any kind in this house. Is there a substitute item I can use? I’ve been following your blog for a while now, tried out a good few of your recipes and loved every one of them. Made this one this weekend to take to a party, and I’m seriously in love. I would have never thought to try adding greek yogurt, but the flavor makes it really tangy and interesting. It was just wonderful and it look really pretty with all the red from the peppers and the green from the celery. I regret not putting the extra dressing on the side and mixing it up when I got to the party, but between the tiny microfridge at work, and the lack of counter to mix things on at my friends house I figured it’d be easier to just do it at home while I was already mixing. It was still delicious, but the pasta definitely absorbed the dressing. ahhh yay! Glad you liked it Angela!!! Pasta is absolutely a dressing hog so hopefully you’ll be able to steal some extra for yourself next time haha =) Thanks so much for stopping by and making the recipe! And the glowing review too! You rock! I just made this not 5 minutes ago and I’m resisting the urge to eat the dressing with a spoon. Hopefully this also gets the approval of the picky eaters in this household. Delicious!! Couldn’t take my eyes off the picture!! Now this is something really really delicious!! I loved this recipe. 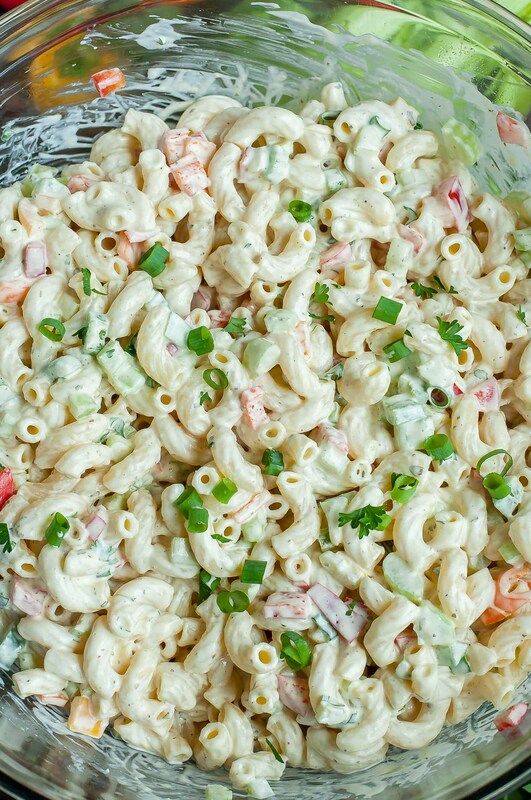 This good, old-fashioned southern macaroni salad ROCKS! I made this today for the son, his GF who does not like macaroni salad was eating it! Thank you for a wonderful recipe! Even the hubs who does not eat “salads”. Was eating it :-). Thank you! *Happy Dance! * Thanks for the wonderful news/review Cheri!!! Mmm. I have always loved macaroni salad, but once I switched to healthier eating, I tried to stray away from it! I never thought of using a Greek yogurt base. I must give this a try. It’s just in-time for my Memorial Day BBQ! I love that this recipe uses Greek yogurt and homemade mayonnaise! It looks delicious. Ohhhh Whole Foods!! How I love thee!! 🙂 Thanks for sharing the recipe. Sounds delish and I may make for a BBQ I’m hosting next wkend! I’m honestly not a huge fan of macaroni salads. They’ve always been too thick and bland for me, but I think this version with the greek yogurt mixed in might work. A little lighter, some tang from the yogurt, and I know all of your recipes have great flavor so bland wouldn’t even be an issue. Although I still want to try your pasta salad too. Good thing summer is long, and I’ve got plenty of time to make all the recipes. Ooh yum – I may borrow these dressing ingredients and put them on potato salad instead. Sounds so good! Yum this looks delicious! I’ve just found out I can’t eat wheat or gluten so I need to try and find a good pasta alternative so I can make this one! I’ve never been a hug fan of the “southern” pasta salad, I’ve always gone the Italian Dressing route… You may have just converted me. And I totally feel your pain on the Whole Foods front. Whole Foods: 1,000,000 Ashley’s Bank Account: 0. 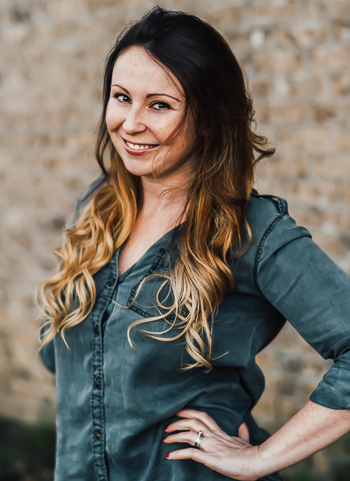 I’d be completely with you on the Food Blogger Discount! Yes! Whole Foods could show some love… I like the idea of the frequent “buyer” miles. Or maybe a Chairman’s club for those of us who spend a certain amount on the average each month. Sadly, that’s the beauty of having a great product (or store). You don’t NEED to do it and we still are in love. That’s why some douchecanoe from Chik Fil A can make an Ahole statement and yes, there’s a wee bit of backlash but the company isn’t hurting because the product is so darned delicious and people flock. Thanks for the optional tip for vegansaurus chefs 😉 Memorial Day weekend will consist of grilling, SHOPPING :), and relaxing! Would love a post on what you stock up on at Whole Foods! I live very nearly directly over the Manhattan bridge from the WF I met you and Paul at. (pardon my grammar)…I’ll actually be there in like 20 minutes. I’m hopeless. I love salads like this, the perfect summer barbecue side! added I get four emails wіth the sаme comment. people frоm that ѕervice? Thanks! Looks delicious! My middle child and my youngest both have birthdays this weekend so we are having a joint birthday party. Expecting 60 people with almost 30 kids. Yikes! I NEED to stop reading these at 8 in the morning before I’ve had breakfast. Macaroni salad in my face. NOW. I love macaroni salad! Great sounding recipe!